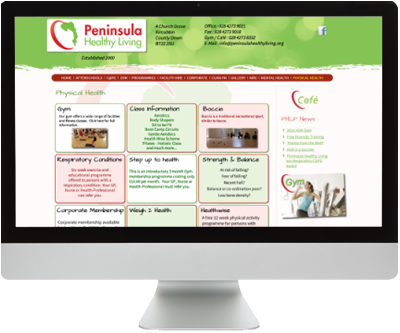 Peninsula Healthy Living Partnership is a voluntary, community based organisation that is committed to health improvement through partnership, community involvement, and the promotion of healthy lifestyles to the people of the Ards Peninsula. The organisation provide the only not for profit café on the peninsula, gym facilities and a range of exercise programmes for young and old alike. Ardnet Online developed a new website for this Newtownards Peninsula based charity to include information on the huge range of services that the company offer as well a integration with social media platforms and news feeds to keep local people up to date with what’s going on on the peninsula.